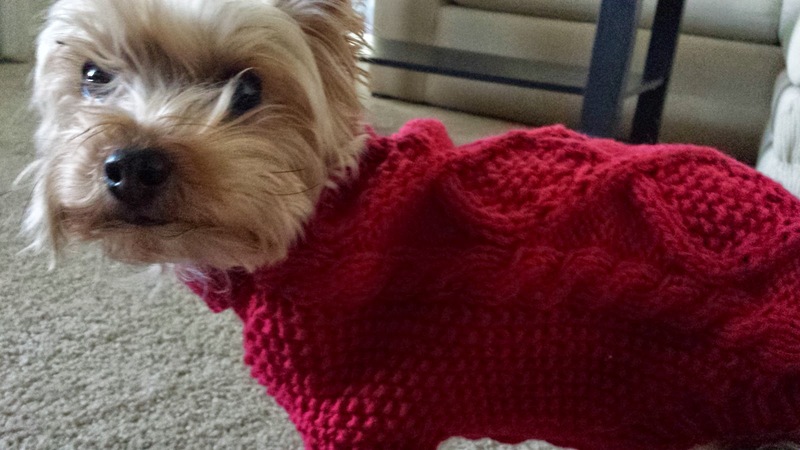 Every dog needs an $80 baby yak down, cabled sweater. Right? Yes I know - I've gone over the deep end. But really I couldn't help it! We're traveling up to New Hampshire to visit the family for the holidays and it's COLD up there! After not living in the great Northeast for going on 10 years (has it really been that long?!) I have lost my New England heartiness to harsh weather. 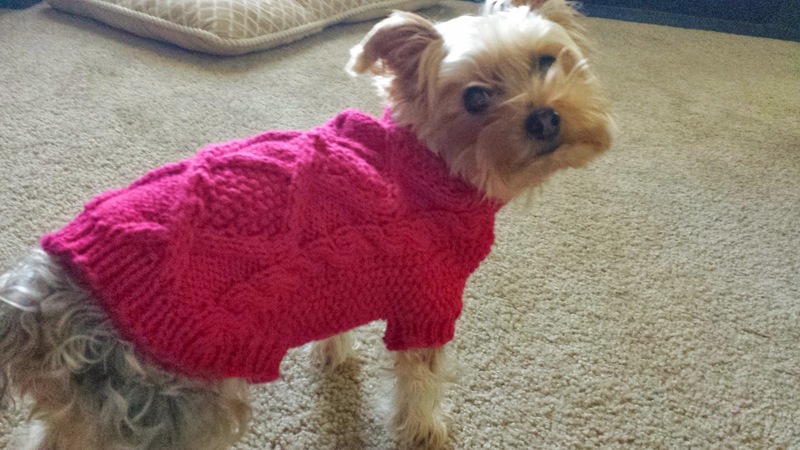 And my little poor yorkie is even worse than me in the cold. AND (!) 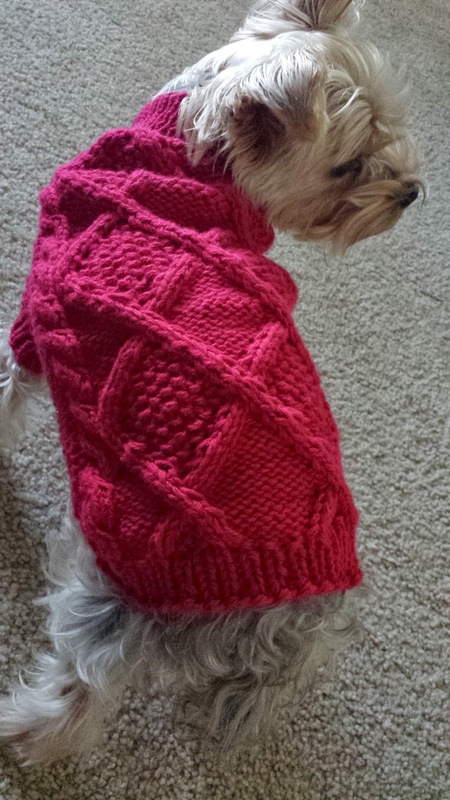 I was scheduled to teach my cabled dog sweater class at WoolWinders Yarn Shop, so why not make her a special sweater for the trip. So yes, the pattern is nice. 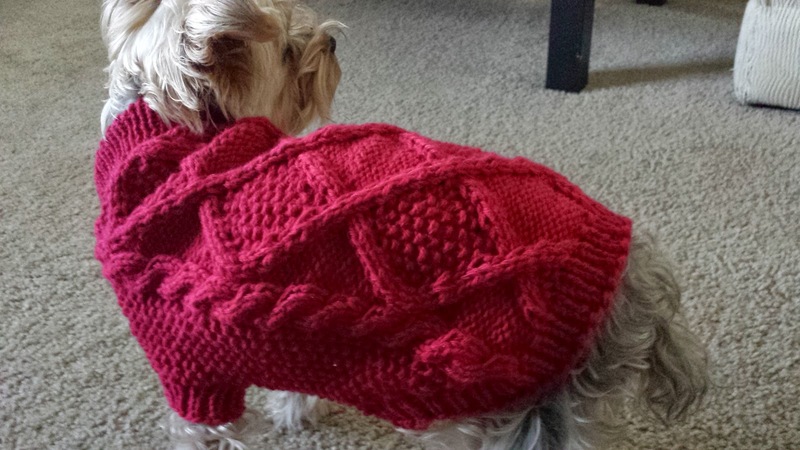 It's my revamp of my basic dog sweater. 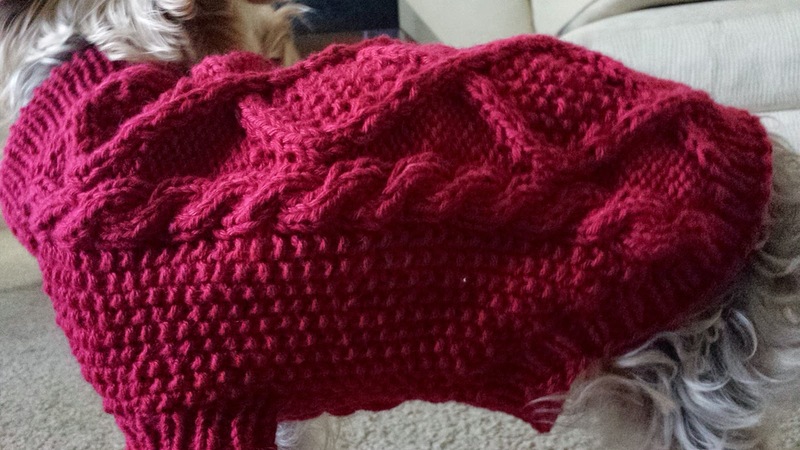 Actually I've blogged about this cabled pattern before so I won't talk too much about it here. Instead I want to focus on this yarn. Oh this lovely, lovely yarn. Yak down is one of those luxury fibers that everyone is curious about but not many get the chance to play with. Lucky for me, WoolWinders recently started selling Reywa Fibers Embrace (100% Tibetan Yak Down). So why is yak so exceptional? The qualities of yak fibers are unique because the undercoat (or down) is made up of fibers from around 14-22 microns and approximately 1-inch long. It is comparable to the softness of cashmere but because of the small fiber size, actually warmer than merino wool (some say 10-15% warmer!). Another aspect of the fiber is that there are tiny ringlets (also known as crimp) which gives a fabric knit or woven in spun yak down nice loft, warmth and softness. The scales of the fiber are in a unique wavey mosaic pattern which results in a smooth fiber that doesn't itch. And a big bonus is that there is no lanolin in yak. So the fiber is easy to clean and is hypoallergenic. Not to mention the natural breathability of the fiber allows garments to remain warm even when wet and can help the individual wearing it regulate temperature (warm or cool). With all of these wonderful qualities, why don't we use more of this amazing animal fiber?! Well yak down is actually quite rare. 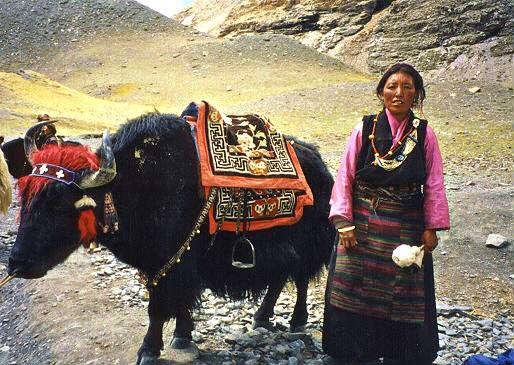 The average yak produces only about a kilogram of fiber annually. And that includes the long guard hairs in addition to the down. Pair that with the fact that yaks tend to be found in more remote regions of the world (side note: there are some breeding ranches... but those are far and few between). Thus... you have an expensive (but rightfully so) fiber! The yarn I used here was from Reywa Fibers. 'Reywa' means hope in Tibetan. The yarns from this company comes directly from the Tibetan Plateau and is made by the nomads of the region. Profits go directly back to the Tibetan communities. Actually Reywa Fibers have invested a lot back into the community and if you have a chance, read about it here. She's not happy now but next week when we get up to New Hampshire, guess who is going to love this thick, warm, beautiful sweater?! Happy Holidays and keep warm (and go get some yak!). We knit fabrics. We also dye those and fabrics. So, we should be always aware of the weather conditions. Therefore, we all use portable weather measuring instrument generally. weather shop for weather measuring instrument is the most reliable source to get it.